Use a glass to cut the raclette slices into circle shapes. Cut the top and bottom rinds off the camembert and reblochon cheeses and stack them together on top of each other, to give you 3 'towers' of cheese. Wrap each of the cheese towers in pizza dough till they are completely covered. Smooth the edges to get a tight seal around each cheese. 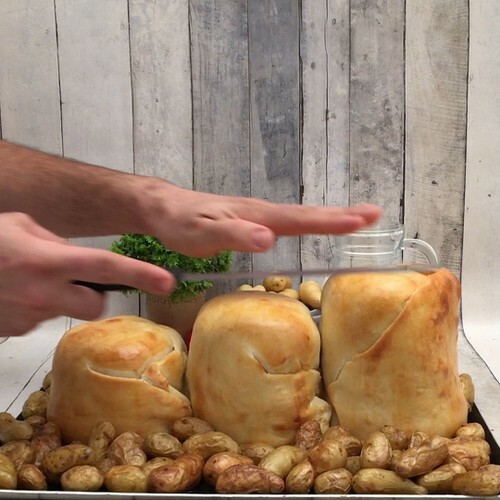 Place the wrapped cheeses on a baking tray and spread the potatoes around them on the tray. Add olive oil and salt and pepper to the potatoes, and cook the tray in the oven for 50 minutes at 180°C. Cut the top off each cheese tower and sprinkle with chopped parsley. Dip the potatoes into each cheese fondue and enjoy.